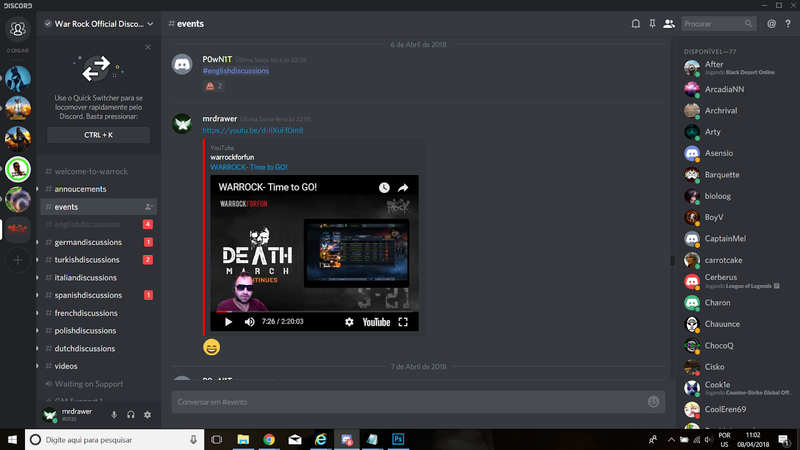 If you are looking for some way to talk to your friends by voice without having to pay or DOWNLOAD anything, I recommend that you use Discord. Step 1) Entering To enter a server, simply click on the invitation link that was provided and accept it. You may need to set up an account (recommended) before using a channel. Just follow the on-screen instructions. You can also download the application for Windows, Mac, Android and iOS. To enter a channel, you must enter the link address in the "Enter a server" section. Note that if you have already entered one, this will always be remembered in your account, so you can enter using the computer browser and just log into your account on the mobile. Step 2) Setting Up To change your microphone, sensitivity and various other settings, simply click on the gear that is next to your name at the bottom of the screen. Step 3) Using The voice and chat channels are separated from each other, so you can be in one independent of the other. To enter any of them, simply click on the channel title. Problems: - Many reported that they can not be heard or heard using the browser platform. The solution is to download the application to your computer or mobile phone. Do not worry, they are very light..